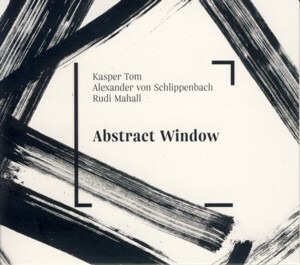 This is the debut album by the trio consisting of Heavyweight Champions of the European Improvised Music scene: Danish drummer Kasper Tom ChristiansenFind albums by this artist and German pianist Alexander von SchlippenbachFind albums by this artist and clarinetist Rudi MahallFind albums by this artist. They perform eleven relatively short improvised pieces credited to the three participating musicians. The trio is a wonderful example of the continuity of the European Improvised Music tradition, bringing together musicians from three generations: Kasper Tom (born 1981), von Schlippenbach (born 1938) and Mahall (born 1966). The age and experience differences are of course completely irrelevant as far as the music is concerned. The album also crowns the fast developing career of Kasper Tom, who with his consistently excellent contributions as performer and composer pawed his way from anonymity the international repute in this extremely competitive field in a relatively short period of time. The music also emphasizes the nature of European Improvised Music, against its parallel from across the pond. These relatively short pieces are concentrated expressions of Freedom, which is articulated by the unity of the trio and not by a race of musicians trying to blow each other off the stage. The music is of course everything people familiar with these musicians in particular, and the European Improvised scene in general, might expect: brilliant musicianship, wonderful respect and attention towards each other, minimalism and elegance, all these of the highest caliber. Improvised Music does not get better than this. The individual statements are also very interesting, being completely different from each other. Von Schlippenbach plays long beautiful arpeggios and harmonic chords, which constitute the basic layer upon the music is floating. Mahall carries the role of a story teller, spinning his short, dramatic tales consisting of long series of notes. Kasper Tom plays everything but a steady rhythm, but at the same time he still is the metronome of this music. His tribal approach turns the rhythmic patterns into a multicultural experience. Of course the performances present a series of wonderful solo, duo and trio improvisations, which spontaneously emerge in the process. Overall this is an instant classic, an album which other Improvised Music recordings will be measured against, not in the sense of competition but in the sense of setting an example others should learn from. Absolutely essential to all Improvised Music connoisseurs!